An allegedly intoxicated driver left a swath of destruction in his wake on November 11, smashing cars and structures in downtown Lunenburg. Witnesses say a male driver in a black Ford Truck hit a number of cars and structures on Lincoln Street in Lunenburg today after a Remembrance Day Ceremony in the waterfront town before police were summoned. Freelance photographer Alex Pearson says he witnessed the man reverse into a car hard enough on Lincoln Street that he actually moved the vehicle he hit several feet before lurching forward and driving off and taking out a couple of parking meters further down the street. 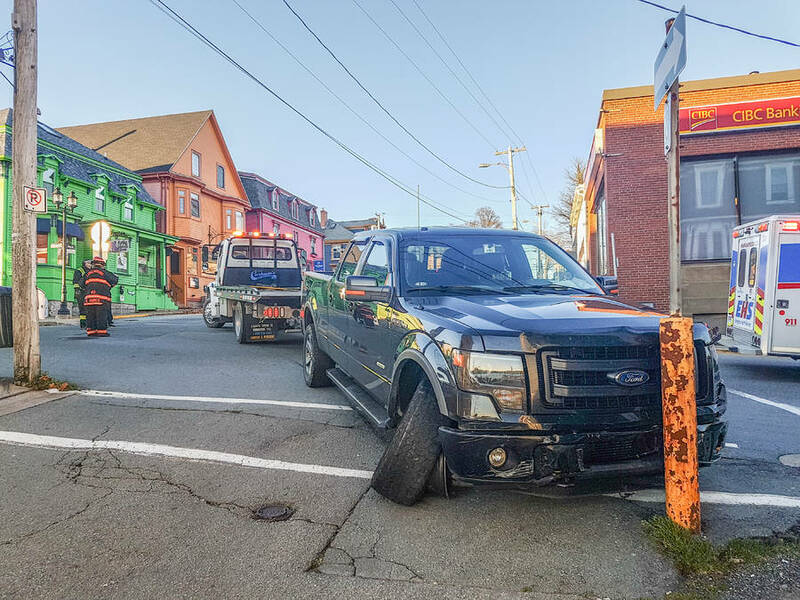 Even though the tires on his truck were deflated from going over a curb, the driver continued on, side-swiping a silver SUV before hitting a stop sign on the corner of King and Montague Streets. At that point the police arrived and detained the man, who appeared to be in his 40s. Pearson said one of the Legion members told him that the individual was allegedly intoxicated. Local police identified the man as a veteran, according to Pearson. RCMP spokesperson Jennifer Clarke said she wasn&apos;t aware of the situation, but would look into it. People were also discussing the incident on the Lunenburg Community Bulletin Board on Facebook. One woman wrote that her mother was in her store at the time and "the truck took out the parking meters." She went on to say that one of the meters went into the window in the hair salon beside the store. According to the women, "then [the driver] hit a car in front of Rudolfs and then hit Mom&apos;s Buy and Sell [and] lost a wheel and ended up by Subway."